MOSCOW (AP) — Russia’s Defense Ministry said Thursday that the United States appeared to be running a clandestine biological weapons lab in the country of Georgia, allegedly flouting international conventions and posing a direct security threat to Russia — allegations the Pentagon angrily rejected. The exceptional accusations from Moscow came the same day U.S., British and Dutch officials accused Russian military intelligence of being behind multiple cyberattacks. 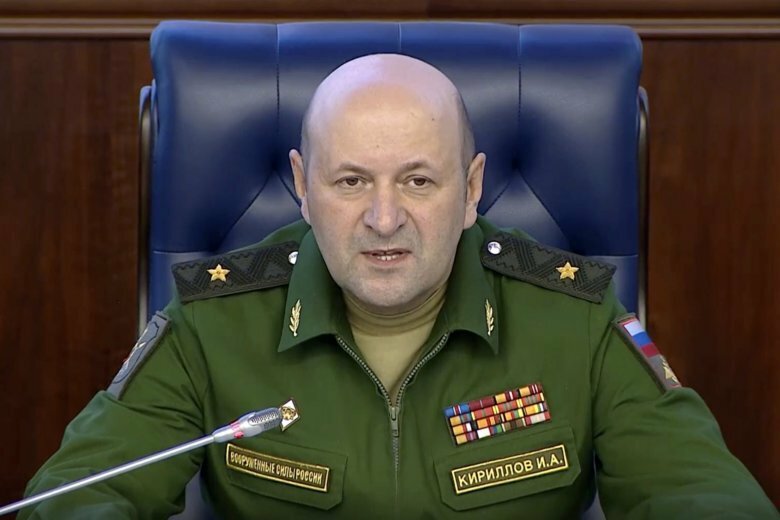 Maj. Gen. Igor Kirillov, the head of the Russian military’s radiation, chemical and biological protection troops, alleged at a briefing that the lab in Georgia was part of a network of U.S. labs near the borders of Russia and China. The allegations were based largely on materials about the U.S.-funded Richard G. Lugar Center for Public Health Research in Tbilisi, Georgia. Kirillov claimed the documents released by former Georgian State Security Minister Igor Giorgadze showed the facility was funded entirely by the U.S and the Georgian ownership it has on paper was a cover. “The U.S. is not developing biological weapons in the Lugar Center,” Pahon said. He said the lab, a joint human and veterinary public health facility, was owned and operated by the Georgian National Center for Disease Control and Public Health (NCDC), not the United States. “The mission of the Lugar Center is to contribute to protection of citizens from biological threats, promote public and animal health through infectious disease detection, epidemiological surveillance, and research for the benefit of Georgia, the Caucasus region and the global community,” Pahon said. The center opened in 2013 and was named for former U.S. Sen. Richard Lugar. Before he left Congress, the Indiana Republican was part of a bipartisan U.S. effort to help secure the Soviet arsenal of nuclear and other weapons of mass destruction after the 1991 breakup of the Soviet Union. Russia’s Kirillov said the documents published by Giorgadze signaled more sinister activities were happening under the cover of civilian research. He noted that Giorgadze’s materials cited the deaths of 73 volunteers who took part in tests of a new drug at the lab in 2015-2016. The claim couldn’t be independently confirmed. Kirillov alleged the deaths showed the Lugar Center used the volunteers as guinea pigs in tests of a new deadly toxin. “The near simultaneous deaths of a large number of volunteers give reason to believe that the Lugar Center was researching a highly toxic and highly lethal chemical or biological agent,” he said. The Russian general also claimed that the spread of viral diseases in southern Russia could have been linked to the activities of the Lugar Center. He pointed to the spread of the African swine fever (ASF) from Georgia since 2007 that caused massive losses for the Russian farm sector. Ticks carrying the Crimean-Congo hemorrhagic fever, a deadly viral disease, also spread across several regions of southern Russia in an unusual pattern, another sign of the U.S. lab’s alleged involvement, Kirillov said without specifying a time period. “It’s highly likely that the U.S. is building up its military biological potential under the cover of studying protective means and conducting other peaceful research, flouting international agreements,” he said. Among the documents released by Giorgadze was a U.S. patent for a drone intended to disseminate infected insects, he said. Other patents covered projectiles for delivering chemical and biological agents. He noted that Russia was worried about the U.S. military commissioning the collection of genetic materials of people from various regions of Russia, including the North Caucasus, and was unsure of the project’s purpose. The lab in Georgia is “just a small element of a part of a sprawling military and biological program of the United States,” the general said, adding that the Pentagon allegedly has other labs in countries neighboring Russia. “The choice of location for such labs isn’t accidental,” Kirillov said, characterizing the research facilities as “a constant source of biological threats” to Russia and China. This story has been corrected to show that former Sen. Richard Lugar of Indiana is alive and center was established when he left Congress. Robert Burns in Washington and Angela Charlton in Paris contributed to this report.